We have invested heavily in one of the best 4 wheel alignment systems in the market. The Hofmann system operates with 8 sensors to ensure the most accurate set up meaning you know your alignment, castor and camber are all as they should be. If you settings are incorrect for example after fitting new tyres your car will not handle and perform as it should and can lead to further problems and uneven tyre wear. 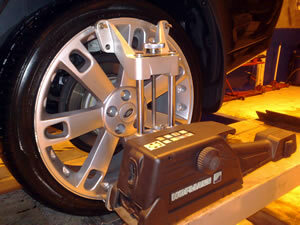 Wheel alignment is very important to the health of your vehicle and can some times be overlooked. If you hit a large pothole, you might bump your suspension out of the carefully calculated locations that the components have been set. Wheel alignment should also be checked after fitting new tyres, also if suspension has been lowered or replaced to give maximum tyre life and make a vehicle track straight and true when driving along a straight and level road. What work do you do for 4 wheel alignment? Before starting work we carry out a pre alignment check to ensure that your car can be aligned successfully. Should there be any worn or damaged suspension components these will be identified and the customer advised. We setup the computer with details of your vehicle, it even requires to be told how much fuel is in the tank to ensure the adjustments we make are highly accurate. Initial measurements are taken to establish the adjustments that are to be made which will be specific to your model of car. Wheels will be aligned according to manufacturer's specification, or will take into account any modifications to your vehicle. When complete all four wheels will be parallel to each other and positioned straight with the steering wheel centered. 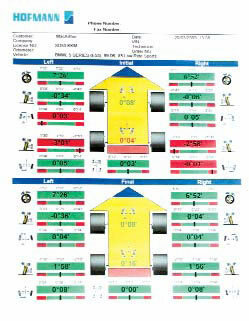 A computer printout showing before and after 4 wheel alignment has been completed is available.